The event, traditionally held around Purim time, was geared towards grandparents and provided a window into the lives of their grandchildren as well as a chance to interactively join them in a creative activity and special experience. Guests were invited to join the children in their classrooms, where they participated in a variety of interactive activities. 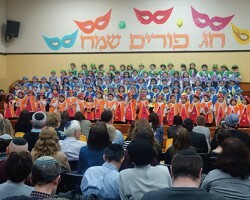 The students performed in a choir, lead by JEC music director Chana Salomon, and sang together as a department but then performed two songs each, class by class. The 2017 JEC Lower School video was screened, with great applause erupting at the end, as the final scene depicted the human formation of the JEC logo. The day culminated back in the auditorium, were guests were treated to beautiful refreshments and gift mugs filled with hamentashen.